Following the previous year’s success of Amazon’s Echo devices, the company decided to step the Echo line up in a variety of ways. While the new lineup adds screens for some devices, the Echo Plus attempts to save you some time, and money, by integrating a ZigBee-enabled home hub within. This aside, we have the same Amazon Echo of the previous year, with Wi-Fi and Bluetooth capabilities. Retailing for $149.99, and often coming with at least one Philips Hue light bulb (the bundle we're currently reviewing), the Echo Plus endeavors to save you over $100 in extra, otherwise necessary equipment. 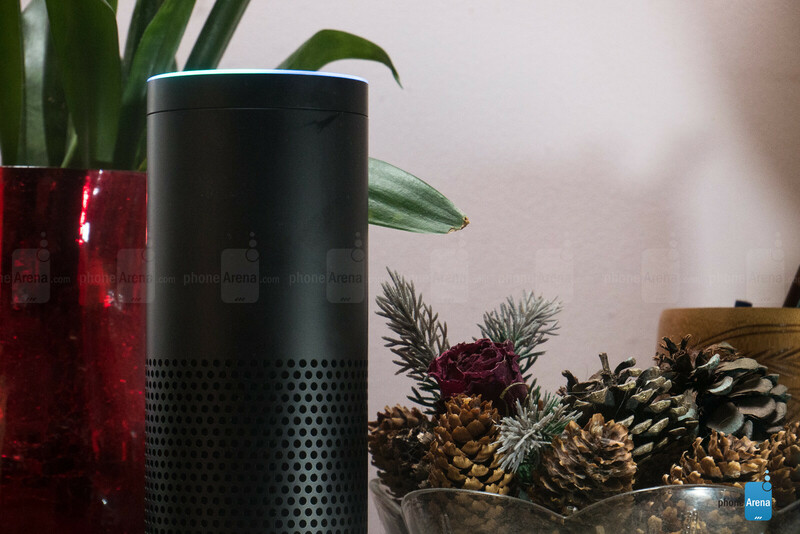 The Amazon Echo Plus features the same well-known, tubular form-factor as last year’s regular Amazon Echo, and is virtually indistinguishable based on appearances alone. However, the Echo Plus makes some slight internal changes, and adds a silver color option to the black and white variants. Integrating a 3.5mm jack, the Echo Plus is able to connect to external speakers via hardwire or Bluetooth, just like the secong-gen, regular Echo. Amazon also mentions that the speaker’s audio performance has been improved with its 2.5-inch downward-facing woofer, and 0.8-inch tweeter. This should serve to deliver fuller, more even sound, while the seven far-field microphones have also advanced a generation, improving the speakers overall wake-word detection. Of course, the most significant internal upgrade comes in the form of an integrated ZigBee hub. Aside from Bluetooth and Wi-Fi, ZigBee, along with Z-Wave, are two of fastest and most reliable radio waves used to control smart home devices. Unlike Bluetooth or Wi-Fi, though, ZigBee and Z-Wave devices create mesh networks that increase range by repeating the signal from one device to the next, and function in a sort of “always on” capacity. 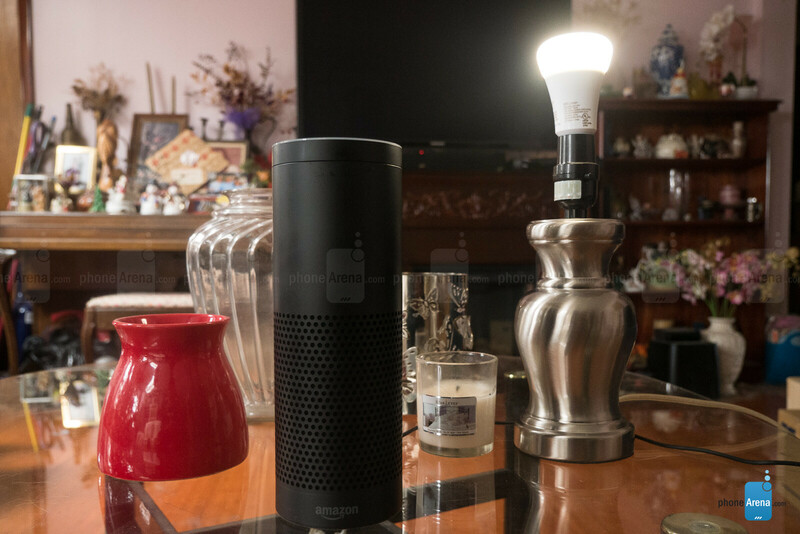 The inclusion of this hub allows the Echo Plus to directly connect to the included Philips Hue light bulb, as well as over 100 other ZigBee-enabled devices – without the need for a separate hub, such as the Philips Hue Bridge, Samsung Smart Things, or Wink hub. Along with ZigBee radios, comes the standard Bluetooth and Wi-Fi connectivity. 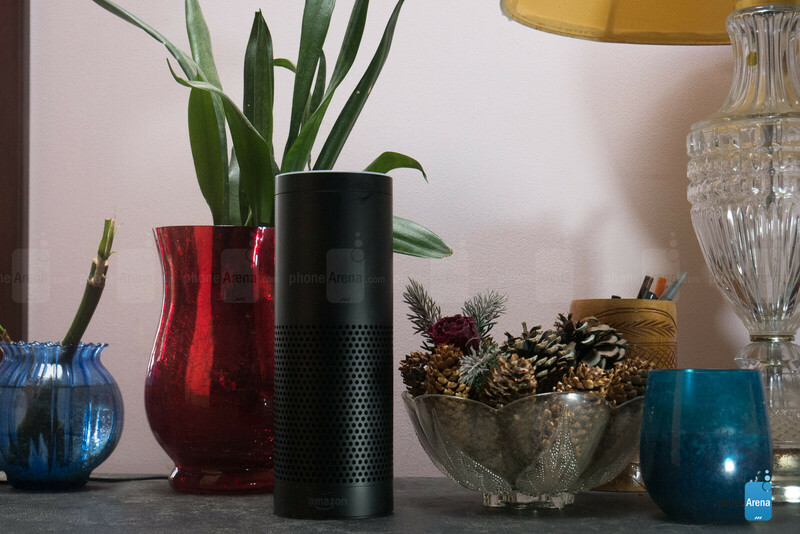 Setup on the Echo Plus is quick, whether you’re new to Amazon Alexa or not; the only additional step is logging into an Amazon account. Otherwise, the Echo Plus turns on directly to its pairing mode, where opening the Alexa app will prompt you to simply find the Echo device in your phone’s Wi-Fi settings, connect, and return to the app. From there, your home Wi-Fi information is gathered, and you’re next given the option to set up the Echo Plus as a Bluetooth speaker or standalone device. All of this is achieved in a few quick screens. Later, deeper customizations may be made, such as training Alexa to recognize, and therefore react differently to various people’s voices, giving a more personalized experience to each user. Pairing the included Philips Hue light bulb was a breeze, as well. Once the bulb is screwed into the desired lamp and turned on, you can either say “Alexa, discover new devices” or tap “add device” in the smart home tab of the Alexa App. Within a few seconds, the light blinks to signify its successful connection, and you’re all set. This is the same process by which you can connect over 100 different ZigBee-enable devices, including smart locks, switches, outlets, and more. 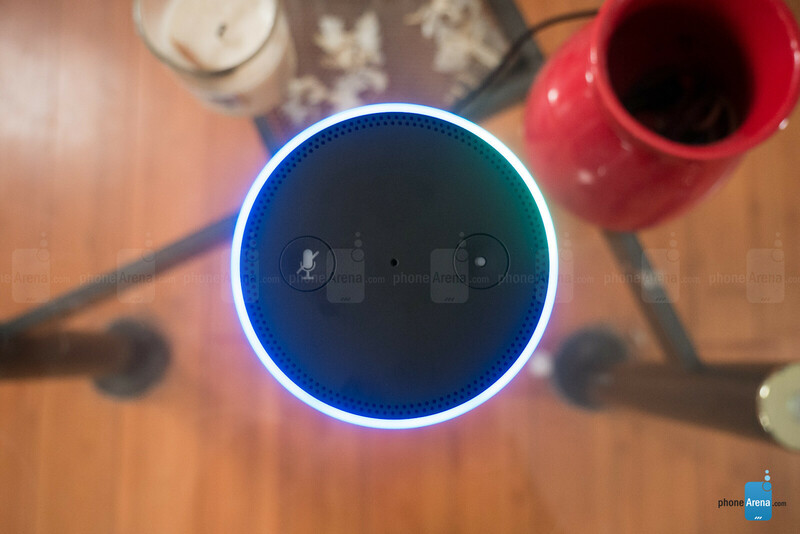 With this second generation of Echo devices, users will find some additions in the Alexa app, but some refinements can still be made. As was the case before, the Alexa app allows you to control music playback when streaming from your Echo device (those times when you say, “Alexa play pop music”) as well as access lists, reminders, and Alexa skills. Skills have always been Alexa’s strongpoint, offering users thousands of ways to integrate some of their favorite smart home devices, such as hubs like Samsung’s Smart Things and Logitech’s Harmony Hub universal IR remote, as well as applications like those to order (or make) food, start your car, or play a game. As far as Alexa’s search functionality goes, it’s been improved but still doesn’t reach the level of comprehensiveness that Google Assistant does on the Google Home. Searches are often more accurate and more expansive when it comes to the content one can search through Google Assistant. But Alexa does now support some follow-up questions in the conversational structure which Google Home first introduced (i.e. “What’s the weather today?” “What about tomorrow?”) but unfortunately functionality is still quite limited in comparison. Alexa still doesn’t do very well, or respond at all, to follow up questions about much else besides the weather. More relevant to the Echo Plus, is the Alexa app’s bolstered smart home integration. Now with more visual representations of what’s in your smart home ecosystem, and in many cases, deeper controls of which to match, the Alexa app takes an important step forward in becoming a proper graphical user interface for the voice assistant housed within all Echo devices. 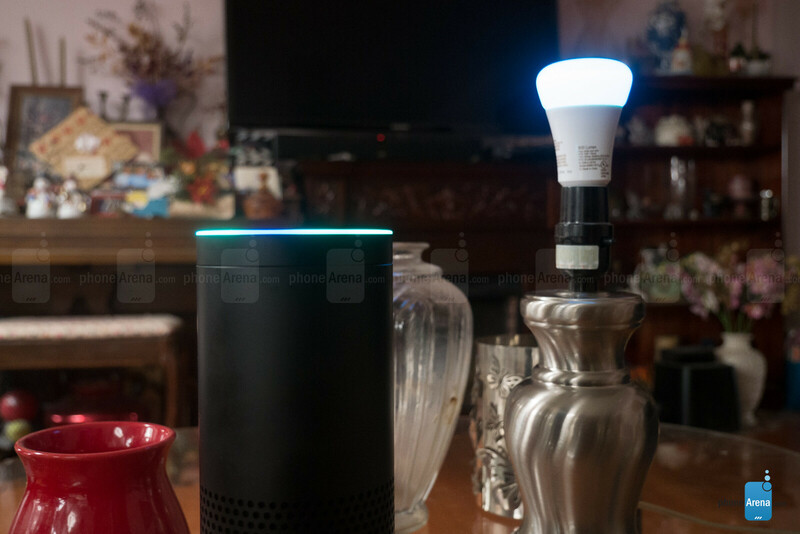 For example, the Philips Hue light can be dimmed, or the color changed, directly from the Alexa app, as well as through voice commands – functionality new to the Alexa app that truly lets users forego buying a Philips Bridge. The app also adds the ability to create groups of devices – living room, for example – which allows you to trigger actions from multiple, varied devices from a single phrase. For example, “Alexa turn on the living room” may turn on all the lights and other ZigBee-enabled devices, but will still require a Hub (and corresponding Alexa skill) like the Logitech Harmony Hub, to also turn on IR devices like TV’s and sound bars with the same command. The Alexa app can sometimes be a bit cumbersome to manage devices of old and new. It’s common for new abilities or skills to make other features, or even devices, irrelevant. Instead of the Echo only discovering new devices and adding them to the list, it would be a great improvement to have the Echo recognize devices and actions that no longer exist, and remove them from the app, as well. Currently, one must go through the list and manually enter each device within the app to then delete it. Organization is somewhat improved, allowing the user to see which device is being controlled by what skill, but mass editing tools, as well as quick toggles would be very welcome additions. When talking to Alexa, you must also still be rather specific with your verbiage, despite Amazon’s attempts to simplify things with the integration of groups. If you have a light named “desk lamp” for instance, telling Alexa to turn of the “desk light” won’t get the job done. But the addition of Groups in the Alexa app does allow you to pair particular smart home equipment with a specific Echo device, if you have more than one. For instance, an Echo Dot may be in your bedroom where you have Hue, or other ZigBee-enabled lights, while in the living room you have your Echo Plus, and other ZigBee devices. Not only can your bedroom Echo Dot communicate with the living room devices through the Plus’ ZigBee hub (initiated by mentioning the devices or group by name in your command i.e. “turn off the living room lights”) but if you only say, “turn off the lights” while in the bedroom, only the bedroom lights will turn off; same goes for saying this phrase in the living room – only the living room lights turn off. This way, you have a level of intuitiveness, albeit a programmed one, to recognize which lights you’d like turned off, based on the Echo device to which your speaking. Unfortunately, this runs into some hiccups when you start using smart plugs connected to lamps, rather than smart light bulbs. Because Alexa only recognizes lights that the app knows are actual light bulbs – regardless of what you name the smart plug, “desk light” for instance – Alexa won’t recognize the command “turn off the lights” if they’re actually smart plugs. That is, of course, unless a group named “lights” has been made for these plugs, specifically, which creates a lot of confusion for Alexa and her group sorting. 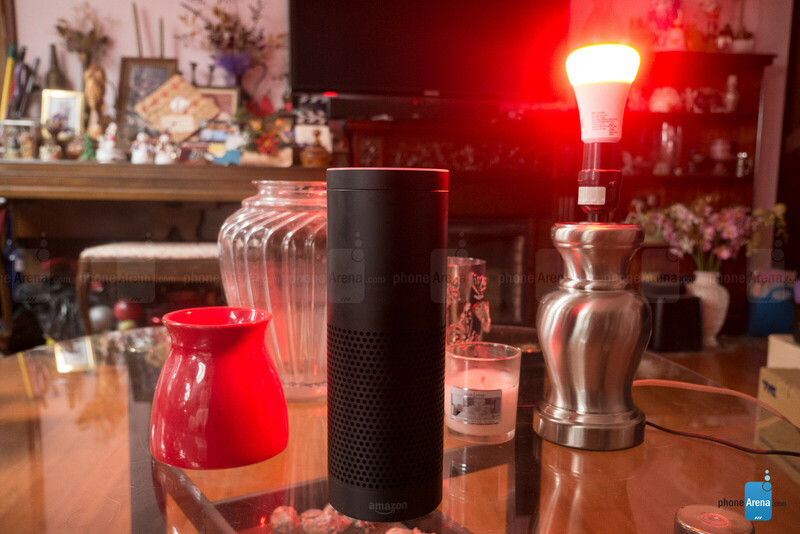 We’d recommend sticking to smart bulbs wherever possible, as this will be a more seamless, and easily controlled setup with the Echo Plus. Using the Samsung Smart Things hub with the corresponding Alexa skill, however, does not present such an issue, allowing Alexa to recognize any device simply by how it’s named – a feature having to do more with the coding of the skill itself, rather than the hubs abilities versus the Echo Plus’ built-in hub. Hopefully Amazon will remedy such annoyances in an update, as other than this the lack of a dedicated hub was never felt. It’s also worth noting that Smart Things still lacks direct connection to Hue Lights, and requires the Hue Bridge to control these bulbs. Amazon’s had a hit with the Echo from just about the very beginning. While the search prowess of Alexa was easily shown up by Google Assistant when it arrived on the scene a year later, Alexa had already amassed over 5000 skills to interface with various apps and smart home devices, leaving Google to play a near-impossible game of catch-up. One year later, and with the introduction of a revamped line of Echo products, including the Amazon Echo Plus, Alexa has over 10,000 skills and the Echos now have some hardware skills of their own. The Echo Plus gives new smart home users a solid, and very reasonably-priced foundation towards creating their ideal connected homes. While the second-generation Echo starts at $99.99, the Echo Plus adds a Zigbee-enabled hub to the mix for $50 more, which could very easily be the only hub you need to build your entire smart ecosystem. With over 100 compatible devices, including switches, plugs, dimmers, lights, and Philips Hue light bulbs – one comes free with the Echo Plus – it seems the only reason a new user would buy a typically-100-dollar smart hub, like Wink or Smart Things, would be to use it with the Google Home. Otherwise, the Echo not only saves you $50, but throws in a Hue light bulb to boot. If you already have an existing smart home ecosystem, though, smart hub and all, then the Echo Plus isn’t a necessary upgrade – simply add a Dot, or perhaps a screen-toting Echo Show or Echo Spot, if you’re looking for more (or more interesting) smart speaker devices. Of course, Google Home is an option too – for the new user, at least – and given what we’ve experienced, it’s a tough one to dissuade anyone from buying, given its search dominance and device compatibility with all the major players. Still, the Echo Plus proves a capable smart assistant and an excellent value. So a straight 10 then for apple homepod I predict. Im sure they would list the many cons for HomePod as well. One of which is surely Siri being inferior to Google assistant. Seeing how siri is probably the worst big boy assistant I can't imagine it getting 10/10.